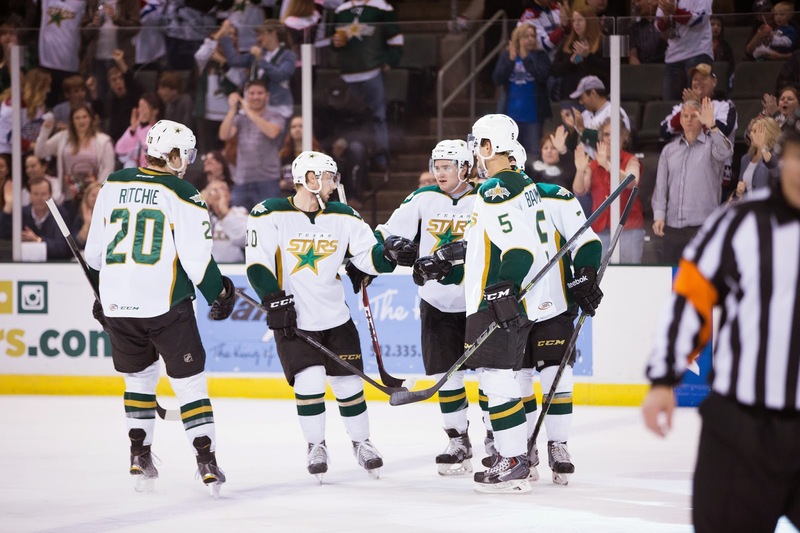 In a game that was ultimately meaningless in the standings, the Texas Stars boosted their confidence heading into the playoffs with a 4-3 OT victory over division-rival San Antonio. "It was an exciting game for the fans," said Coach Laxdal, referring to the sellout crowd for the finale. "It was a good building and atmosphere, and hopefully we can have that in the playoffs." With playoffs on the horizon, Texas rested many veteran players and some who were banged up. That gave a youthful vibe to the lineup. Jason Dickinson, fresh off his junior career, had two assists, each on Matej Stransky goals. The OT hero was Brendan Ranford, a relatively seasoned player in the lineup tonight. He tallied his 18th of the year in the 3-on-3 segment of the overtime frame. It was a good goal for Ranford to get after some OT frustration this year. 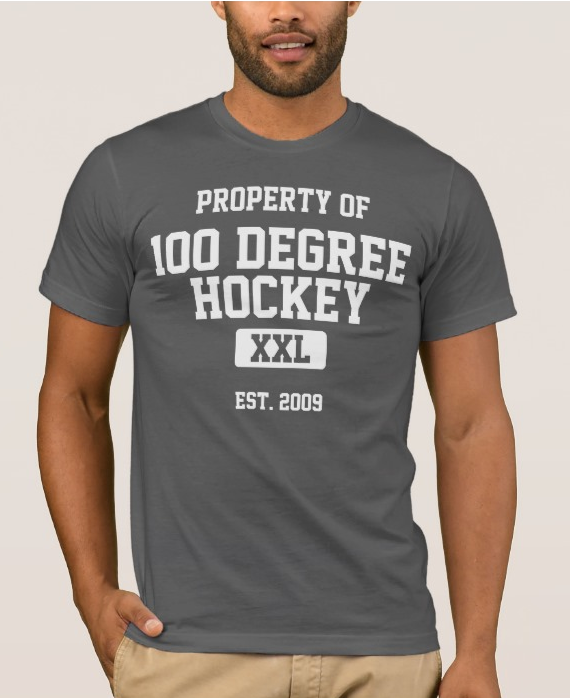 Laxdal added, "[Ranford] probably missed four or five empty nets in overtime all year, so it's only fitting." To add to the frustration, Ranford had a shot undergo a long review just a few minutes earlier in the OT, but the final call was no goal. "I didn't really know what happened," said Ranford. "I thought it hit both posts, but it was lucky to get the next one on the next shift out." Texas started the game off hot with three goals in the first period. 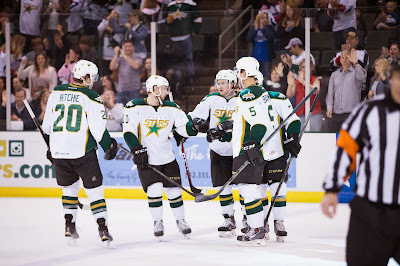 Julius Honka notched a goal from the point with Ranford on the assist. Next Matej Stransky stepped up for two. Jason Dickinson had a big hand in each, dishing out to scoring areas for the Czech winger to bury shots. "Dickinson is a smart, headsy player," said Laxdal. "He's not afraid of traffic and almost scored in overtime. Dickinson is going to get some top 9 minutes [in the playoffs]. The big thing is trying to find chemistry. We think he can play left side or center with anyone." Matej Stransky might be a good linemate for Dickinson after tonight's performance, but it remains to be seen if he can drum up chemistry with anyone who was scratched tonight as well. San Antonio, a playoff-bound club, came back in the second with three goals of their own. Connor Brickley tipped a puck behind Jack Campbell for the opening tally of the second. Wade Megan scored short-handed after Julius Honka got a little too fancy in the neutral zone on a power play. Final Vincent Trocheck popped one in backhand on Campbell in tight off a pileup in front. With the game headed to overtime after a scoreless third, Texas fans likely resigned themselves to the "OTL" mark in the standings one last time. However, the Stars responded with a strong extra frame. Patrik Nemeth and Brendan Ranford broke in 2-on-1 in the 3-on-3 portion to score the game-winner. Tonight's game was the first season finale that the Stars have won in team history (1-5). The Stars, who now know their first round opponent is Rockford, will have a day off Sunday and a team building activity on Monday before resuming practices Tuesday. Friday and Saturday will be games 1 and 2 of the playoffs at Cedar Park Center. You don't by chance have a way of seeing the win/loss record of the teams in the 2nd half of the season do you? I don't have an easy way of doing it at large scale. Which ones do you want? Had a question -- saw a few different guys wearing the A for Alternate Captain., and Dowling was not one of them. Can you shed light on this? Is the A passed around at the end of the season as a morale-booster? Is this common with other clubs? Probably just a chance to trade it around with some of the usual As out. Dowling wore an A in San Antonio earlier this week. Tonight Texas had 27 shots, the night before 54. Why such a big difference? Texas faced 54 shots on Friday. They only had 17.